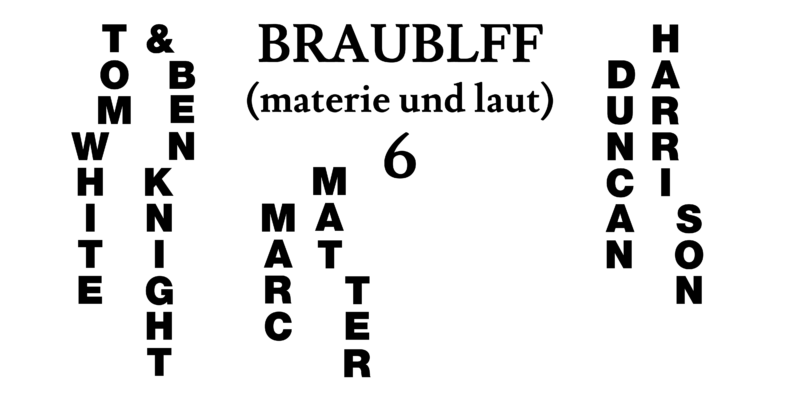 We open the new year with a new edition in what could be called our most radical concert series, the notorious BRAUBLFF (materie und laut) — the ongoing research series that delves deep into the question where and how language transforms into music. Visual artist and composer Tom White is a specialist in brutal yet sensitive reel-to-reel tape manipulations. Ben Knight works as performing artist and musician in the deep universum of the voice and researches as such its inner potential for individual transmutation. They’re both part of the new wave of Great Brittain’s avant-garde aesthetics and radical thinking. In 2016 the experimental radio platform Radiophrenia commissioned them for a piece which resulted in a social-science fiction narrative told in a series of minor narrative episodes; film and props, to reflect on the everyday listening events within and around a drop-in centre for refugees in Manchester. The Brighton based Duncan Harrison is over the last 12 years one of the strong holders within the South English Weird Noise scene. His music displays a broad array of cut-up sound poetry, improvisational strategies and audio collages with sonic left-overs abstracted from daily environments. No surprise he regularly collaborates with the likes of Dylan Nyoukis, Karen Constance, Pascal Nichols, Ali Robertson and many more.